Add all the ingredients mentioned for ‘marinate’ in a bowl along with the freshly washed pieces of prawns. Keep aside for 1 hour. Heat oil in a frying pan, add 4-5 tbsp of vegetable oil, shallow fry the prawns on medium flame for 2-3 mins . Keep aside. In the remaining oil (Add some more oil, if needed) add the sliced onions. Sauté till golden brown in color. 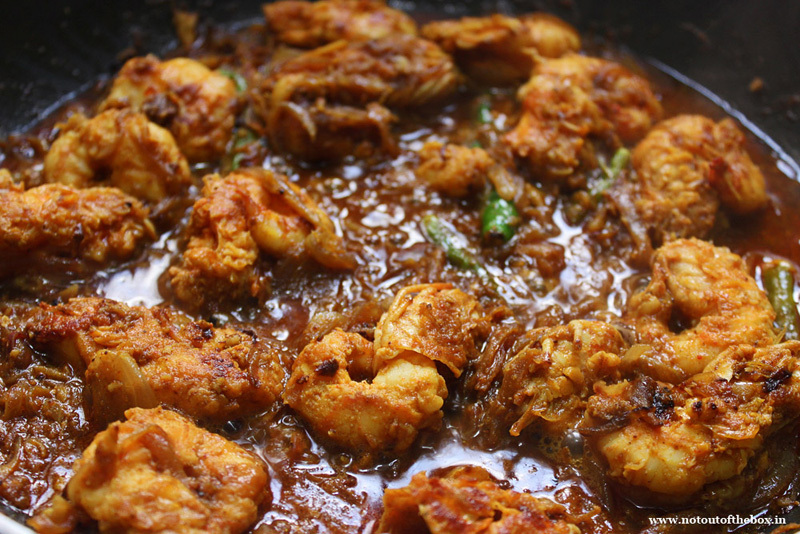 Add ginger-garlic paste & the other ingredients mentioned for ‘ Prawn Masala’. Mix well & fry till oil separates from the masala. Now add the fried prawns, mix well & cook on low heat for 5-6 minutes. Stir in between. Add 1 1/2 of water at this stage. Mix well, cook till the raw smell of masala goes. At the end of this preparation the gravy should be medium thick in consistency. If your gravy is drying up add some more water. Heat ghee in a deep bottomed pan. Tamper with all the whole spices. Add rice, mix & sauté for 4-5 minutes on medium flame. Add enough water to boil. Add salt when the rice is 80% boiled, mix well. Drain immediately. Wheat dough/ Atta dough- Make a dough with wheat flour & water just the way we do for Chapati. Soak saffron in warm milk. Keep aside. Heat 1 tbsp oil in a frying pan. Fry the onion till brown in color. Remove from heat & keep aside. Grease a deep bottomed pan with ghee. Add rice in the first layer. Now add a layer of ‘Prawn Masala’. Sprinkle some ghee, along with some cashews & raisins. Repeat this process of layering rice & prawns one more time. Close the layering process with the final layer of rice. Sprinkle a generous amount of ghee on top. 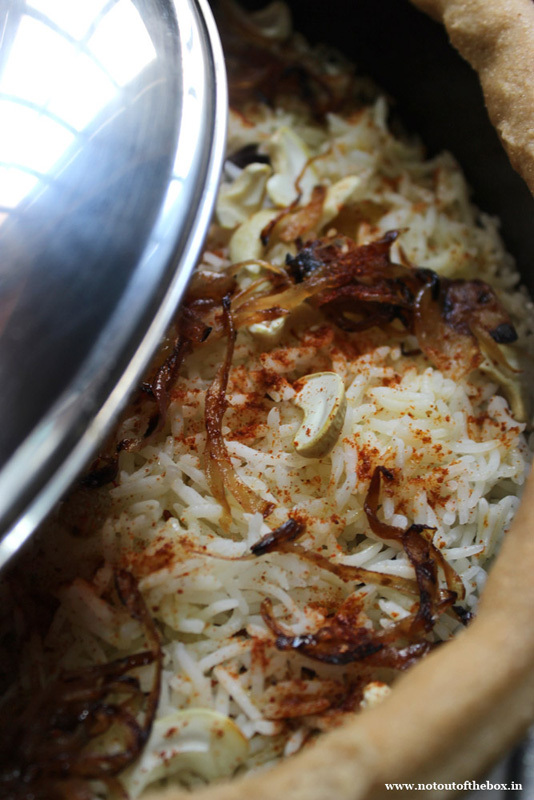 Garnish with fried onions, cashews & raisins, biryani Masala & garam masala. Sprinkle the saffron milk at the end. Spread this saffron milk mixture along with the edge, this way it will reach at the bottom of the pan. Close with a tight fitting lid, seal the edge with atta dough (make a log with the dough, then seal). Turn on the heat. Put a tawa. Now put the biryani vessel on it. Keep the flame as lowest as possible. Put on dum for 30 minutes. Remove from heat. 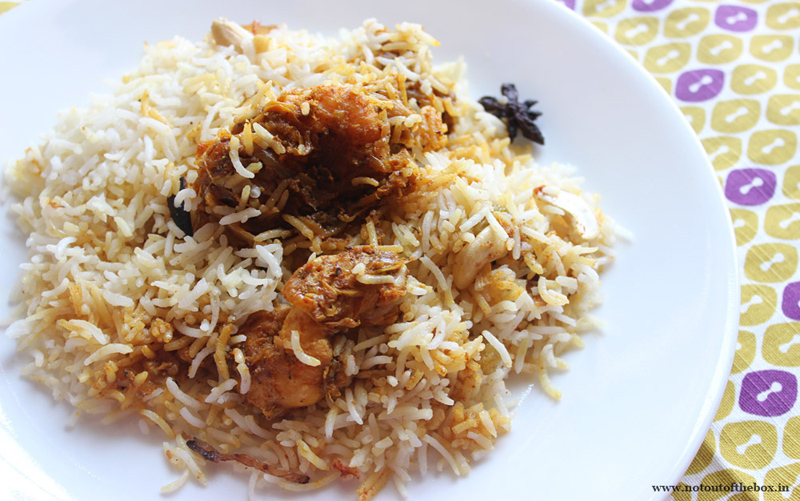 Your yummy ‘ Prawn Dum Biryani’ is done. Break the seal & serve hot with raita. Enjoy! Don’t full boil the rice. Other wise after the dum process, it will become mushy.